An ice storm paired with gusty winds to cripple the Swanton area on Tuesday, knocking down tree limbs and power lines and causing minor havoc on slick roads. A Level 2 snow emergency was was in effect for the county much of the day, reducing to a Level 1 by late afternoon. A Level 2 notice asks motorists to stay off the road unless absolutely necessary. Toledo Edison representative Chris Eck said as of Wednesday morning 330 Fulton County customers were still without power including 55 in Swancreek Township. There were 63 customers reported to have no power in Swanton Township. Downed power lines left a total of 3,700 people in the dark in Fulton County alone during the height of the storm, with many lines felled by tree limbs weighted by ice. Fulton County’s Ohio Department of Transportation garage had trucks out on a 24-hour basis since Sunday, said Mike Fountain, transportation administrator. The road crews pre-treated area surfaces with a combination of liquid de-icer and salt, then continued treating them during the storm. Crew members each logged between 12-16 hours of overtime. Fountain said traffic was kept flowing on the county’s state routes but crews continued to battle ice-covered country roads. He said road crews encountered some felled tree limbs and wires but most have been removed. The Fulton County Sheriff’s Office handled four non-serious accidents, Sheriff Roy Miller reported. He said his department was kept busy mainly with fallen tree limbs and downed electrical wires lying across roadways. The Ohio State Highway Patrol reported a few vehicles in accidents or sliding off roadways in the county but no major problems. 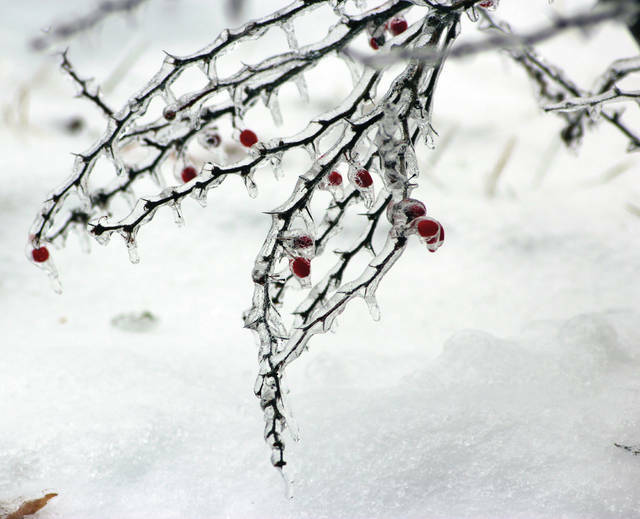 The ice was caused by a low pressure system that combined warmer air from southern states above ground and colder air trapped at the surface, said Geoffrey Heidelberger, a meteorologist for the National Weather Service in northern Indiana. He said the warm air melted snow before it hit the ground, which then froze on contact at the surface. The gusty winds – referred to as gradient winds – were typical for the storm system, Heidelberger said. However the amount of rainfall was a bit uncommon, and the two-to-three tenths accumulation of ice “was pretty significant,” he said. He said a brief chance of snow with little accumulation is possible Thursday. Although too early to confirm, another storm, possibly stronger, could move through the area Sunday. Ice covered everything in site as an ice storm warning hit the Swanton area Monday night into Tuesday. 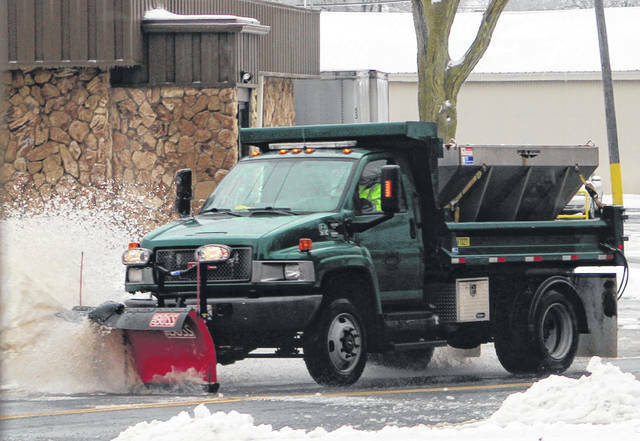 A plow truck clears ice from the road in Swanton on Tuesday.